Last night my back was killing me before I went to bed! I nearly cried because I thought I was getting better and then here I was in huge pain again:( My sweet hubby reminded me that I probably just did too much and that maybe I should take it easy. This morning I was still pretty sore but have rested a good deal today, staying off my feet, and my back pain seems to have eased up a bit. Whew! I am so ready for this whole ordeal to be over!!! It will be a week tomorrow. Sitting in my favorite chair with the dogs at my feet typing this post. Thinking about all that needs to be done that I can't do. I need to just let it go and quit worrying about it. Hopefully in another week I will be able to start getting things done. The Kindle App on my iPad has two books right now-- To Love Anew by Bonnie Leon and A Home in the West by Lori Copeland and Virginia Smith. For our read aloud, we are reading Any Way Out by Ann Vitorovich (about twin brothers who escape communist Yugoslavia in 1957). Not sure...I hate to admit that I might check in on The Bachelor although I can already tell there is going to be waayyy too much drama this season for me! Reality TV??? I don't think so!!! There is nothing real about this show! Our silly Rocky snoring as usual...and the WIND!!! I am on my second week of Weight Watchers Online so am just winging it for now. Hubby and DS seem okay with that as long as they get fed:) I have just been fixing whatever I feel like eating. I will probably do this for another week or two and then get going with a menu again. It comes in toddler's, child's and teen/women's sizes. I am going to get started on it tonight! 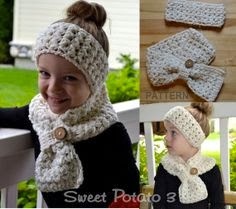 You can find the pattern at Etsy.com. Just way too cute! I just have the flower to go on my granddaughter's crocheted hat and will be ready to mail it off to her. Crocheting or knitting for friends and family. Not to stand on chairs with wheels!!! Actually, I am forbidden to stand on chairs at all now. If I can't find the step stool, I need to get someone to help me or do without!!! After my nasty fall, I am not even tempted to stand on a chair!!! The living room is a little cluttered and the dining room table (our drop spot) needs some attention but overall not too bad considering my condition. 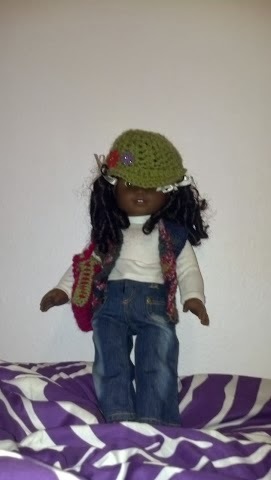 I crocheted a retro vest, hat and purse for my granddaughter's new American Girl Doll, Cecile. She took a picture and sent it to me so I could show you. My brother who wants to make some changes in his life. Tomorrow I will have an update on my January Low No Spend Challenge and my Weight Watchers Online progress. Hi Kat, So sorry to hear that your back pain in back. Do take it really easy today. Maybe a heating pad or ice pack would help. I use a heating pad with my knees every night in bed and it does help. 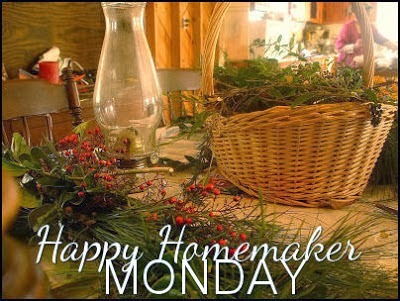 I didn't have time to do Homemaker Monday yesterday...maybe next week. I love you low-no spend challenge and am trying to do that too with mixed results. It has just been an expensive month here, it seems. Hope you are feeling better soon. Have a good and restful day! Oh Deb, I love your visits! I have been using ice packs because I remembered the chiropractor saying, "When in doubt, ice!" So sorry about your knees. Kat, I'm doing WW also, I've slipped sense my hip surgery, of about 2 lbs. but this week I'm returning & doing good w/it already. So it will all work out for U to. I figure w/counting my points again, & walking I don't have anything to worry about. I was hesitant to sign up for WW again because I didn't work the program last time and just wasted my money. I am determined this time. I am sure you will do just fine. Keep me posted! Wed. is my weigh in day, so will let U know, I'm just starting back this Wed. so after that I will look for loosing again.